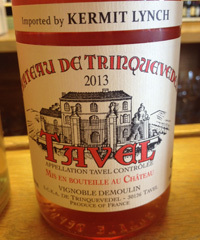 2013 Chateau de Trinquevedel, Tavel Rose, Rhone Valley, France. Having thought I knew a thing or two, I was surprised to learn that Tavel can only be made up of a maximum of 60% Grenache! I had always believed it was much higher if not 100% Grenache, when then now I know better, and that Tavel is one of the great areas for rose is the only regional AC to be 100% pink. Chateau de Trinquedel, founded in 1936, is one of the top estates here, very close to the famed city of Nimes, and their cepage mix in this Tavel is 56% Grenache Noir, 20% Cinsault, 10% Clairette, 4% Syrah, 4% Bourbelenc, 3% Mourvèdre, 3% Grenache Blanc grown on a terroir that includes loam, clay, limestone, sand, marl and quartz soils. The 2013 Trinquevedel is vivid and brilliant with a gorgeous full pink/orange hue, a rich palate and tangy acidity with mineral tones and a spicy kick to go with pretty watermelon, grapefruit, sour cherry and strawberry fruits. There is hints of steely elements, chalk, cracked pepper and garrigue leaving a whiff of almost a lavender essence and finishes bright, fresh and crisp, but lingers with a long pleasing aftertaste, this is glorious and refreshing summer wine, drink over the next 6 to 8 months.